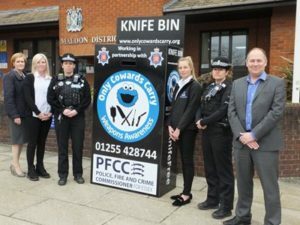 It is part of Only Cowards Carry’s Knife Amnesty Bin Project, which we’re supporting along with Essex Police and Maldon District Council. Maldon’s Community Safety Partnership Manager, Spencer Clarke, said; “The partnership is committed to working with statutory agencies and charities to reduce violence in the district and provide opportunities for early intervention with young people. “This has led to a new knife amnesty bin has been installed in our district in Maldon. Roger Hirst, Police, Fire and Crime Commissioner for Essex, said: “I really admire the work which Only Cowards Carry do. They help make our streets safer. Reducing violence on our streets is one of our key priorities. Essex Police took part in Operation Sceptre, a national crackdown on knife crime, last week. The week of action built on the current work officers are doing to tackle serious violence and kicks off a longer period of action designed to target knife crime.